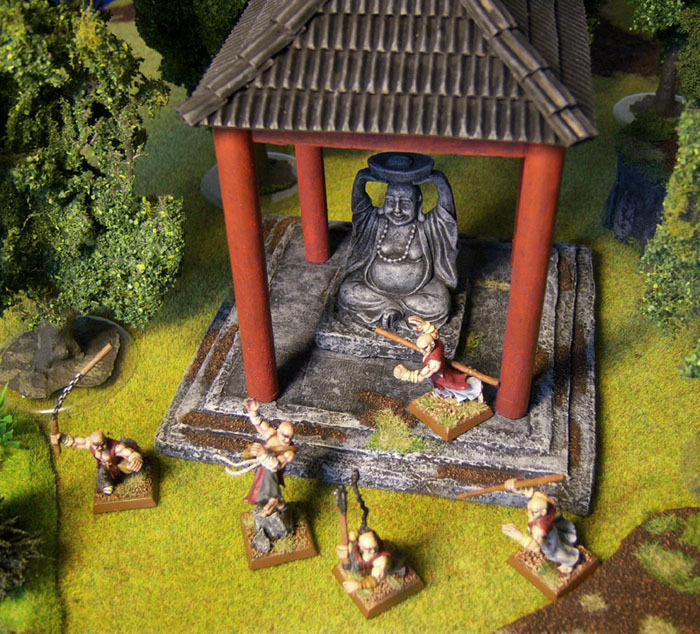 This thread is devoted to the Cathayan buildings and similar scenery pieces that I create for my Cathayan borderlands gaming table. Enjoy! I've been wanting to do this for quite some time but had problems finding an adequate statue. It had to have the right size, an acceptable level of details while not costing a ton of money because it was made of gold or stone. 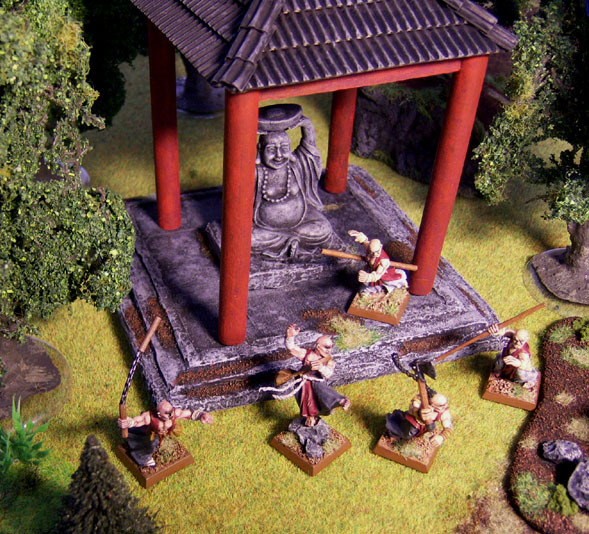 There are several reason why I began my career as a Cathayan architect with a simple shrine (or pavilion): For one it's a quite simple terrain piece that fits easily into my Cathayan borderlands gaming table. 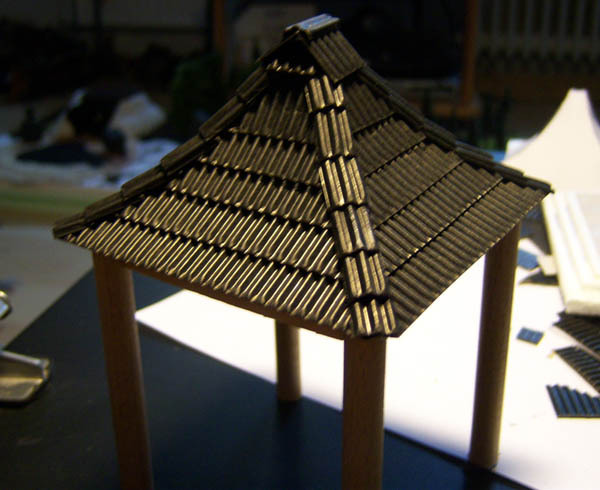 More importantly, however, I wanted to begin with something simple for the first roof with the typical Asian eaves. 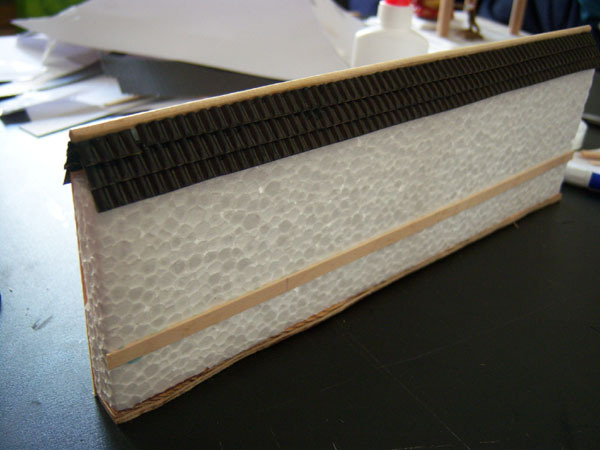 The above photo depicts one of the many prototypes I made for the roof. Since they are so unlike the simple medieval European roofs I had to be very careful and elaborate a bit on how to make the angles. This is what the base looks like now. I'll apply spackle to give it a proper structure. The roof is made of corrugated card board (available in every stationery shop). It's cheap, easy to cut and it looks good. Top stuff!  You may consider this a teaser because there is a lot more coming! whats the other projects your doing to go with this? I'm not gonna spill the beans yet but they are freaking huge (literally!). Did I mention "YOU'RE THE BEST!" What did you use for the tiles on the roof? They look perfect, & would be great looking on Mediterran style buildings also. Excellent work; LOVE the Buddah. I'm glad you're keeping forthcoming projects SECRET;re, the suspense adds to the eventual enjoyment, if a bit of a shocker to the old heart [grabs chest, falls to the floor]. This is turning out to be an Epic work, & following the progress, a delight. May the Muse of Minis smile upon you! Brilliant CIanty! Simply great. I was recently riding the tram, and my mind wandered back to the WIP pics of your Cathayan tower which have been on your webpage for 100 years. And I kept thinking "how the hell is he going to do those curved chinese roofs?" And you just gave me the answer! Great job. Can't wait to see the rest. Very niicely done. I like that the tiling lines up around each corner. Awesome Cianty! Great roofs. I love the statue. Kung Fo Panda. Just Kidding. Cianty...it looks great already. I wish we live in the same area and we would have some great fun. I need to build one of those shrines too. And then I'll have to make a BTB table... and then another shrine... Thanks for uploading! That is a one LOVELY piece of work! BRAVO! AND dare I say it; ENCORE! The only thing better than the fine pieces you've been making is the way you present them. Placing the piece in its natural surroundings & peopling the area with the folks who will be doing battle there REALLY transforms it into SO MUCH MORE. You are a very talented visual story teller. Yet another BRAVO! Are the pillars are removable? Great work again! 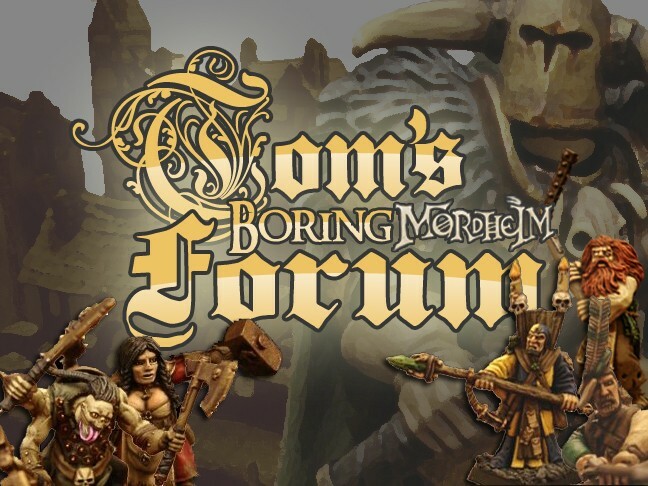 I am so eager to get back to my Mordheim table. Thanks for the inspiration! First off, thank you all for the nice comments! Now I look forward to that! Even if you will probably put me to shame for what I did compared to your work! Yes, they are. 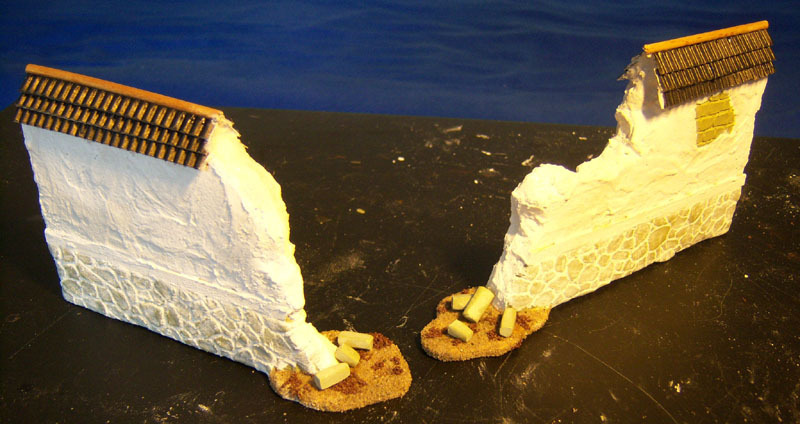 I never even considered glueing them to the base. 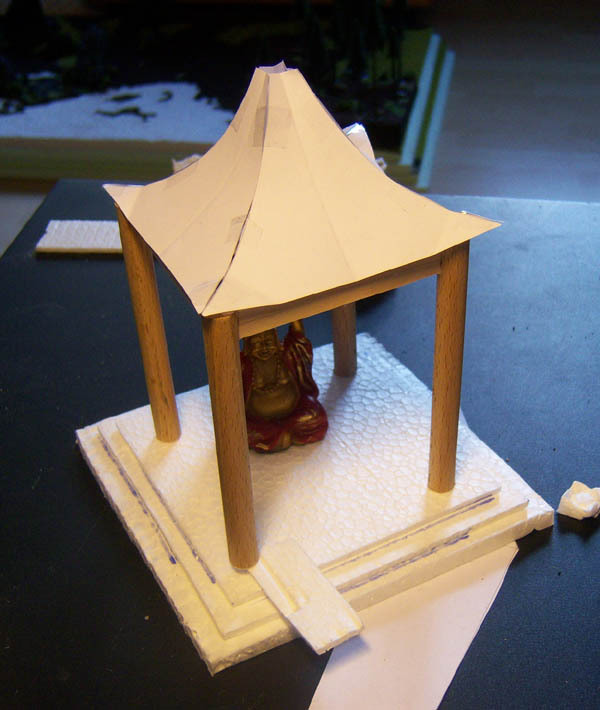 This is a three part piece consisting of the base, the pavilion and the buddha statue. 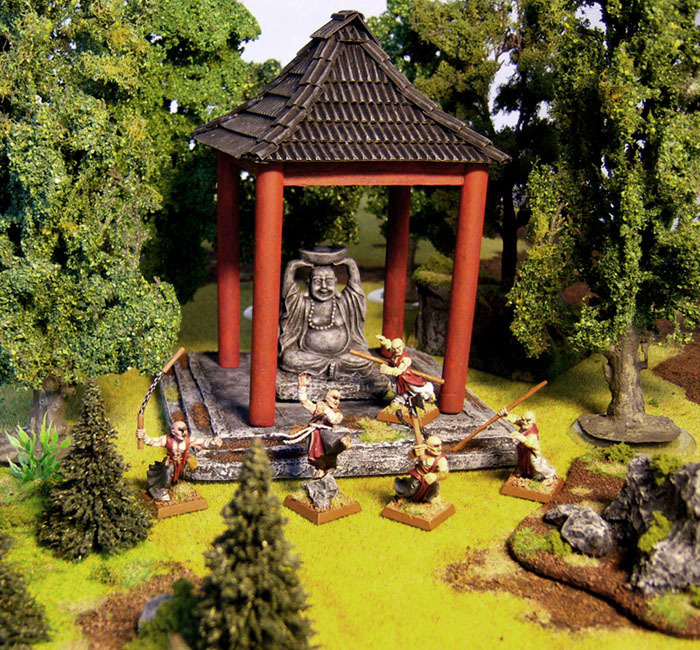 The statue should be removable in case I just want to place a pavilion and the base can be replaced by a better one in the future if I ever feel like doing another. AND dare I say it; ENCORE! 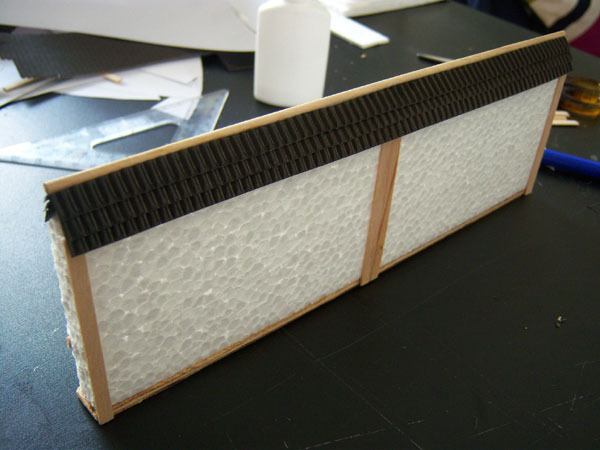 For all of the Cathayan architecture I am currently working on I am using a lot of styrofoam because I have so much of it left and it is easy to work with. 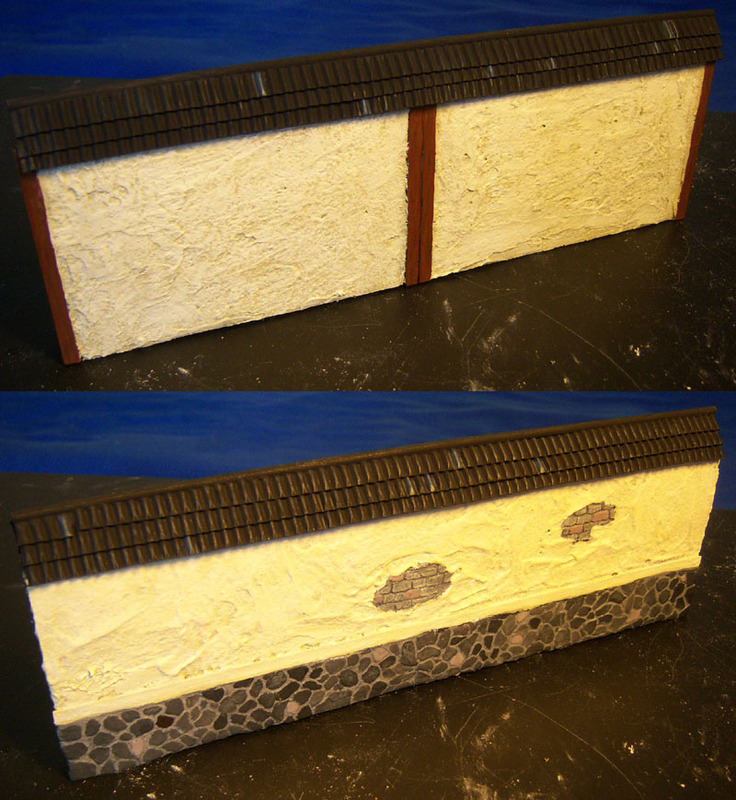 Indeed I wanted to see if I can make some good (acceptable) looking scenery out of cheap and easy materials. I glued two slices of styrofoam and then glued them on a wooden "base". Well, not a base in that sense, it just serves to move the barycentre downwards so the wall won't tilt over later. In the end, it won't be visible. I modelled stones on the lower part of the front using milliput (my first experience with milliput). Also there are some bricks showing through. Finally a coat of spackle was added. 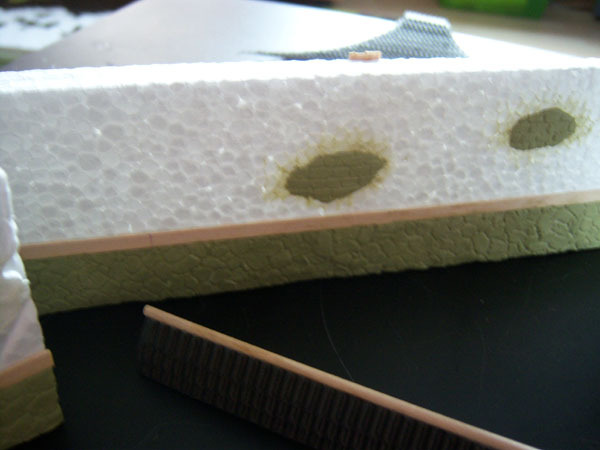 This was also good to fill the holes in the gaps between the modelled stone. Since I "drew" the stones with a toothpick the lines between the stones weren't always straight but in fact consisted of a lot of holes. The spackled shmoothed these holes definately improved the overall look of them. Lastly, I should mention that while I was at it I made two more wall pieces: ruined wall ends. That is so awesome! You are just a endless fountain of inspiration. Those walls are beautiful. 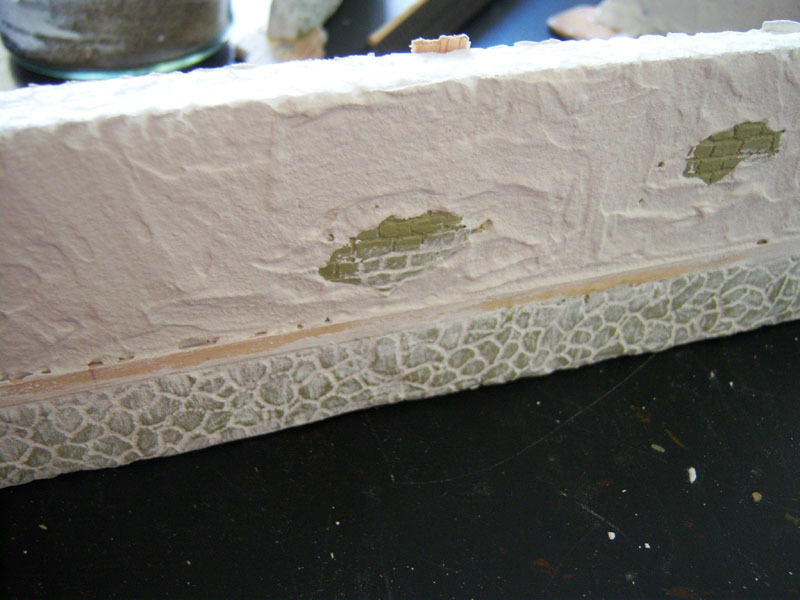 On that type of styrofoam, the plaster/spackle will add a tremendous amount of durability. The capping tiles look great; these would also work nicely for a Spanish/Italian style wall. Thanks for giving moi yet another thing to look forward to [it helps me get up in the morning ]. Checking the dictonary and google picture search I believe "box cutter" is what I meant. I was looking up the word "Teppichmesser" (literally: carpet knife). A little Update: I finished the middle piece. 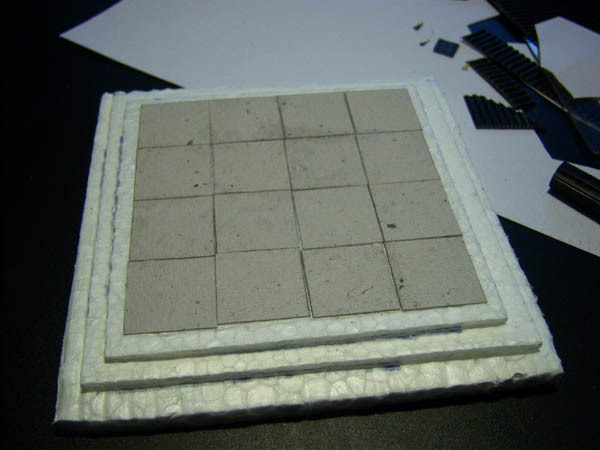 I modelled some bricks from milliput for the wall ends and they are ready for painting now. sweet man! It looks pretty damn good! I like the stone cracks in the wall alot, good job! OOOOOOOOOH, BUT THAT LOOKS GOOD! Very nicely done, very Japanese; I'm VERY IMPRESSED [wow a three very post ] WELL DONE, Weed Hopper! Fantastic Work! I love how you made all of the stuff. I really liike the shrine but the walls are great! Those are freaking awesome. I love the how you painted the Rock section of the wall. Very realistic. Most people (including me) try to paint the grout darker than the rocks. How stable are these walls? If you bump the table do they fall over?